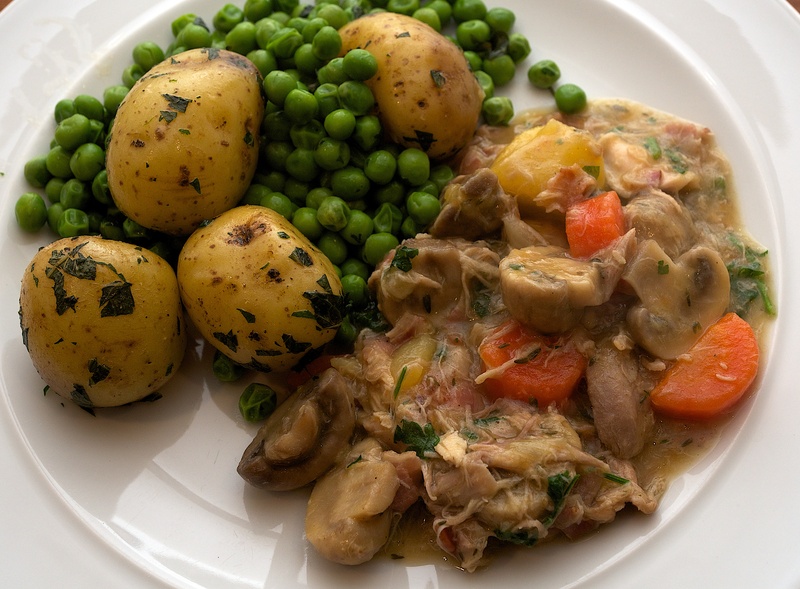 This is a great way to use up leftover roast chicken – including the carcass. Too often we guiltily put the bones in the bin. Wine Suggestion: Our natural instinct when cooking chicken is to plump for a Chardonnay as it goes so well, but instead we drank a delightful German Pinot Noir from Villa Wolf, which is made by Ernie Loosen. He’s managed to get a real charm and ripeness in the aroma that tempts you to think this comes from a warmer country, with even a few hints of new World. It, however, is true to it’s roots and had a rounded earthiness and real charm along with an easiness and gentle weight that didn’t overwhelm the chicken; plus the earthy spice complemented the “humble” nature of this dish too. Place the chicken carcass in a large pan and bash with a rolling pin to break it up. Cover with 1 litre of water, bring to the boil and simmer for at least half an hour, skimming off any scum. Meanwhile, heat a lug of olive oil in a casserole over a medium heat and add the bacon. Cook for a few minutes before adding the onions, carrots and potatoes along with the thyme and bay leaves. Cook for 10 minutes. Stir in the mushrooms, chicken and flour. Pour the stock through a sieve straight into the pan (add a bit of water if necessary). Simmer for 4o minutes and season to taste before serving.